Our range of products include metal alloy soldering iron stand, soldering iron stand and soldering iron holder. Our company specializes in manufacturing quality Metal Alloy Soldering Iron Stand with Imported Sponge, which meets the variegated requirements of our clientele. These are designed as per the international standards. These are appreciated for their features like light weight, portability, corrosion resistance, durability and cost effectiveness. Available in various sizes, these are customized according to the client’s specific requirements. 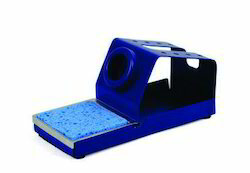 Having vast industrial experience of knowledge, we are offering a quality range of Soldering Iron Stand with Imported Cellulose Sponge. 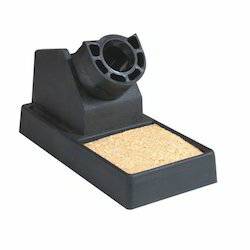 The Soldering Iron Stand with Imported Cellulose Sponge is made by using quality material which is sourced from reliable vendors of the industry.The products we offer is highly demanded amongst the clients for its quality and reliability. Moreover, our products are easy to install. In order to keep pace with the requirements of the clients, we are offering a quality range of Soldering Iron Holder With Ceramic Base. 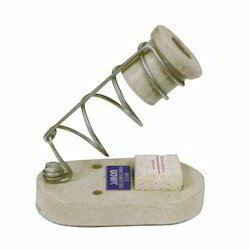 The Soldering Iron holder With Ceramic Base we offer is reliable and durable. These products are safe to use.The product we offer is widely demanded amongst the clients for their durability and sturdiness. Moreover, one can get these products at market leading prices. Looking for Soldering Iron Stands ?